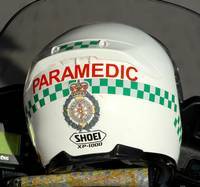 On four occasions in the last month, ambulance bikers were left unable to respond to 999 calls for up to four hours after their helmets were stolen or damaged while they were treating patients. 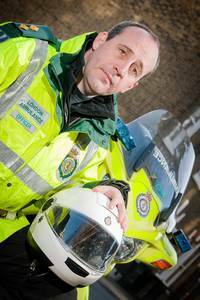 In Lisson Grove, Paramedic Jim Marr returned to his bike after a treating a man with a serious head injury, to find his helmet mindlessly thrown over a fence and cracked. He was unable to respond to 999 calls for three hours while arranging a replacement and speaking to police. Motorcycle Response Coordinator Shaun Rock said: “As a motorcycle paramedic you’re there to get to the patients in the most serious condition first and begin assessing them. For the most part people respect our equipment, but recently our helmets have been stolen or wilfully damaged while we’re treating patients. “This is unacceptable for two reasons. Firstly, it means our staff are not able to respond to patients in a life-threatening condition while they wait for a replacement. Secondly, it costs £600 to replace the helmets because they are custom-fitted with radio equipment. For further information about the London Ambulance Service or this news release, including high resolution images, please contact the communications department on 020 7921 5113. The Motorcycle Response Unit (MRU) responds to emergency 999 calls in central and east London every day from 7.00am to 11.00pm. All MRU paramedics have taken a course in police motorcycle-driver training. The Service has been operating a MRU in central London, out of Waterloo ambulance station, since 1991.